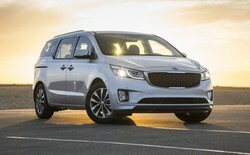 The Kia Sedona may not be the first name you think of when shopping for a new or used minivan. The original Sedona had almost everything needed to be a success in the minivan segment, but it was pudgy, weighing some 400-700 pounds more than its rivals, which blunted acceleration at higher speeds and didn't do much for cornering ability. Still, overall performance was relatively refined, if not exciting. Set against the backdrop of one of the world's premier urban playgrounds, Kia Motors America (KMA) took the wraps off the all-new 2015 Sedona midsize multi-purpose vehicle in New York City. As the final chapter in Kia's design-led transformation story - which began in 2009 and has seen a comprehensive makeover of Kia's entire model line under the direction of chief design officer Peter Schreyer - the all-new Sedona's CUV-like styling and proportions offer all of the functional convenience of the segment while defying its design limitations. The Sedona is premium comfort with the power to transform. Aggressive and refined, it’s your getaway vehicle and lounge on the go. The Sedona is comfort for everyone, fitted with high-tech gadgets, like the Smart Power Liftgate, and available second-row First-Class Lounge Seating. Kia introduced the second generation Carnival/Sedona worldwide for model year 2006–in short (SWB) and long-wheelbase (LWB) models – with a 2-inch-wider front track, 3-inch-wider rear track and reduced turning radius than the first generation. The first generation model was manufactured and marketed differently for specific regions, including under a joint venture in the Chinese market with Dongfeng Yueda Kia Automobile Company, as well as the Naza Ria in Malaysia.